This is one of the more interesting chocolate bar configurations I've come across since I started reviewing candy in 2008. I purchased it from a Jewel Osco grocery store while visiting family in the Chicago suburbs. 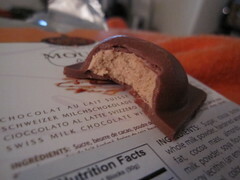 The "bar" looked a bit like bubble wrap, and consisted of little chocolate pods full of caramel flavored mousse. According to the package, the chocolate was imported from Switzerland. 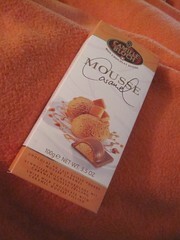 Now, I can't give this bar a real rating, since it's been almost a year since I tried it. I misplaced my tasting notes, but it seems a shame to waste the pictures, and to not talk about the few things I do remember about it. The chocolate pod was milky and rich, and the caramel-flavored filling was sweet but very smooth and melted like a decadent ganache. I can definitely say I would love to try other products by Camille Bloch, but I haven't been able to find anything since. If you're interested, check out better reviews of Camille Bloch products at Chocablog, Candy Addict, and Candy Gurus. I always see these at Liquor Barn and think they look interesting - I might actually have to get one now! They are quite tasty! Next time we visit, I'll have to pick some up, because I can't find them up here!